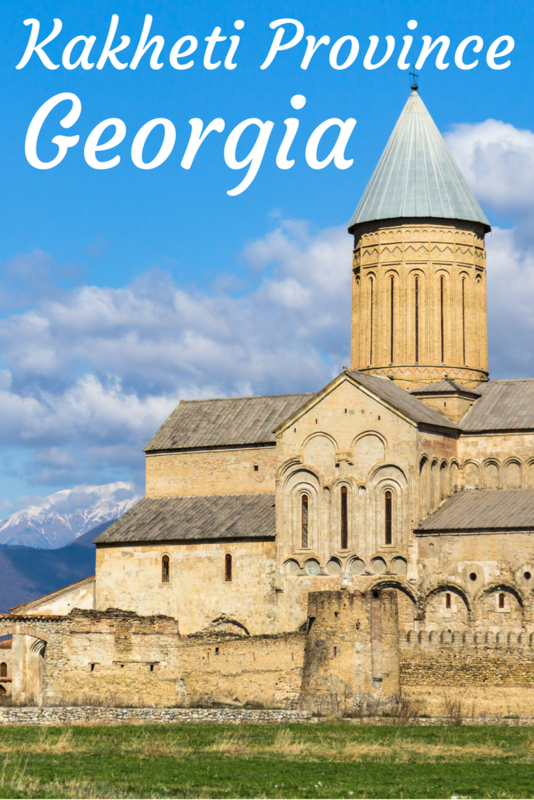 When we spent time in Georgia (the country), we were fortunate to be able to see many different regions of the country. Our first trip out of Tbilisi was to Kakheti, the easternmost region of Georgia which is bordered by Russia and Azerbaijan. 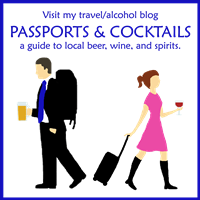 The Kakheti province is probably most famous for its wine. 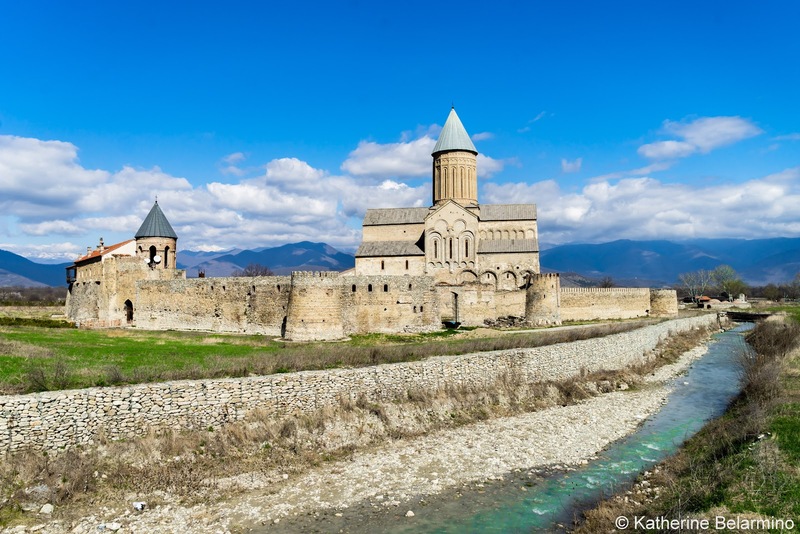 In addition to wine, Kakheti has churches, fortresses, and scenery. Kakheti has always been an important region of Georgia. Hundreds of years ago, when Georgia was occupied by the Persians, the Kakheti region was the richest region in Georgia, so the Persians would tax the harvest instead of destroying Kakheti, which is what they did to many other regions of Georgia. That is until 1616, when the Georgians rebelled. 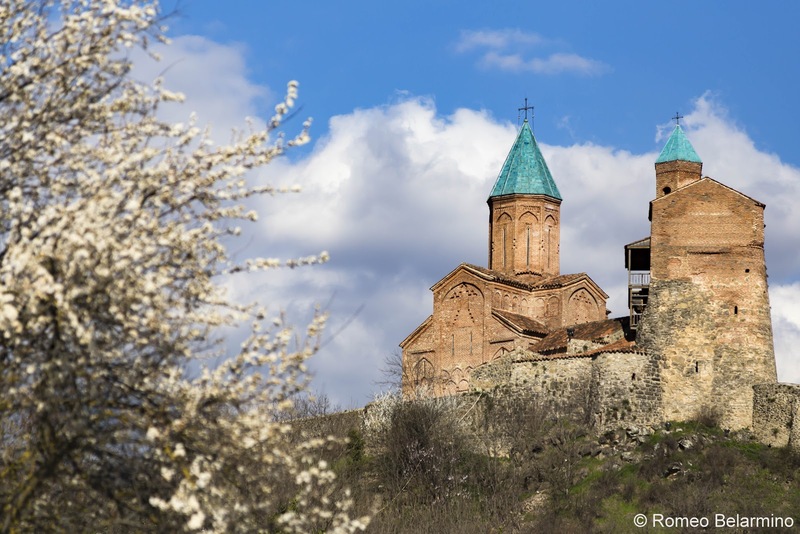 While Kakheti can be visited on a day trip from Tbilisi, there are a lot of things to do, so we suggest spending two days in Kakheti with an overnight stay. 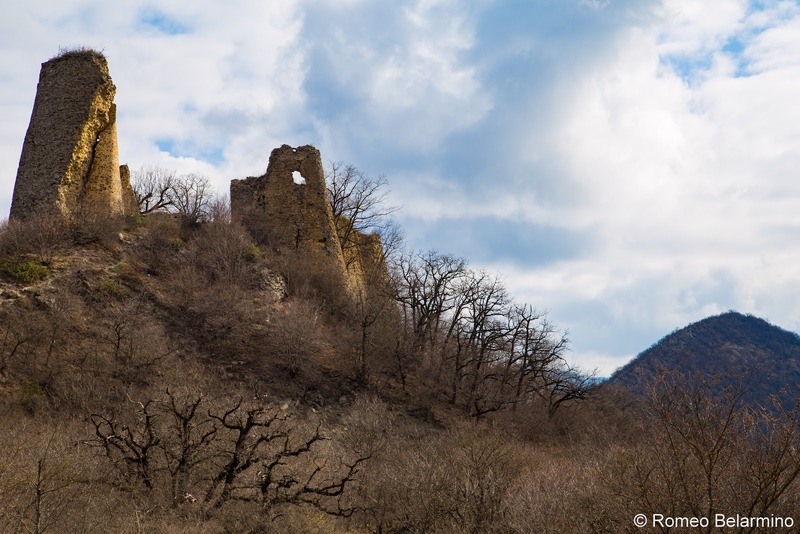 On our way from Tbilisi to Kakheti, our first stop was Ujarma Fortress. Ruins on a hill are all that is left of Ujarma Fortress. Ujarma Fortress was built by King Vakhtang Gorgasali, also known as Vakhtang Wolf’s Head, in the 5th century as the second capital of Georgia. It is believed that this is also where Vakhtang Wolf’s Head died, shot with an arrow in the shoulder. As we continued our journey through Kakheti, we traveled along Gombori Pass, the highest spot, at 1600 meters, on the way to Telavi. Georgia is a small country, yet has five climate zones, some of which are passed through when climbing the Gombori Pass. With this change in elevation comes great views of Georgia’s varied landscape. 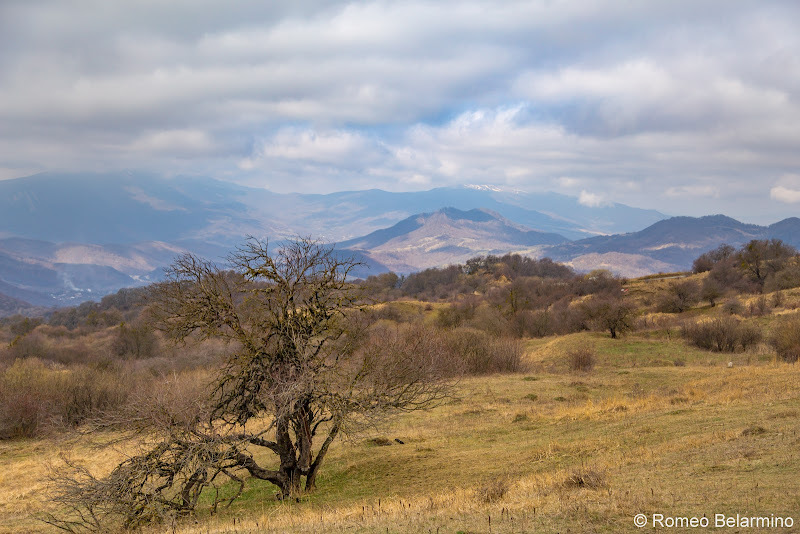 Alazani Valley is one of the many wine regions of Kakheti. In this part of Georgia, residents don’t care about the outside appearance of their houses. Wine is much more important here, and if your house has a wine cellar that’s been around for centuries, it’s the best house there is no matter how it looks. Many homes in this region have underground wine cellars that are very old and are treasured heirlooms of the owners and an important part of their heritage. A house may be rebuilt several times over an old wine cellar. We noticed that there are lots of old cars and learned that Soviet cars are very popular in Alazani Valley because they are durable and can hold up to the bad roads. Alaverdi Cathedral was the tallest religious building in Georgia for centuries, but is now the second tallest at over 55 meters. 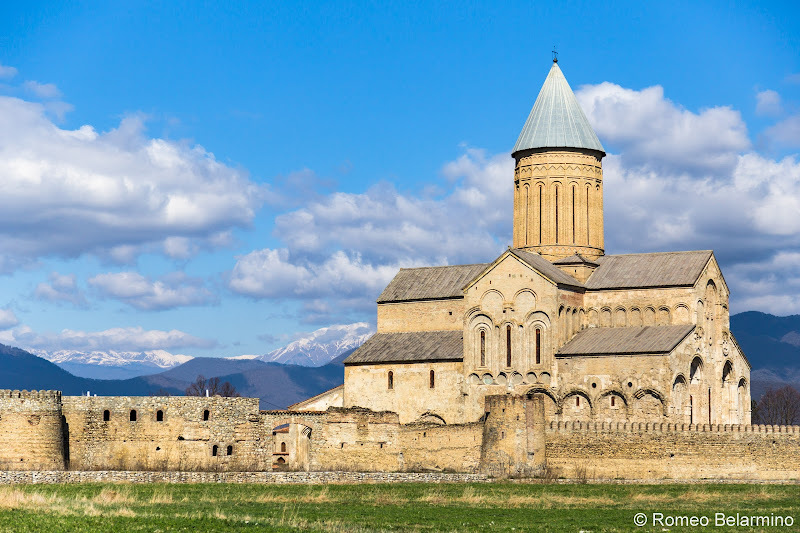 Alaverdi Monastery was first founded in the 6th century by Father Joseb from Alaverdi, who is buried in the monastery. The St. George cathedral was built in the 11th century by Kakheti King Kvirike. The cathedral was restored in the 15th century after being damaged by war and again in the 18th century when the dome was damaged by an earthquake. 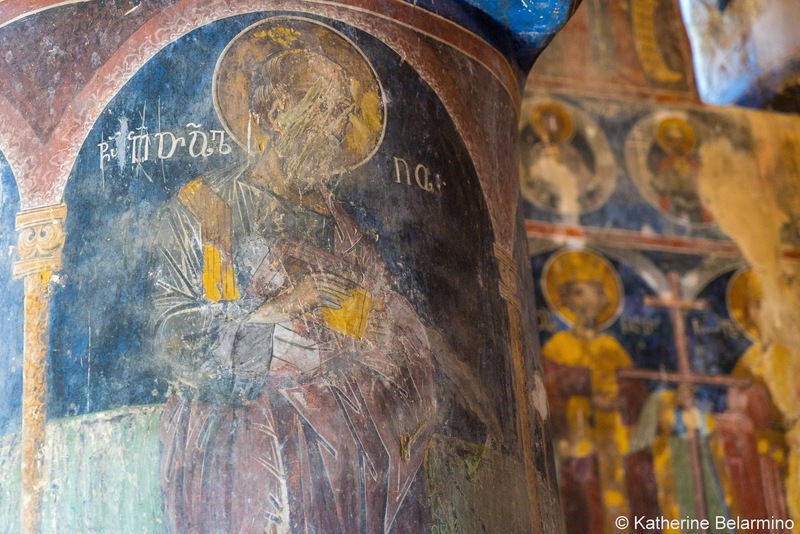 Old frescoes remain, though faded and only pieces remain. 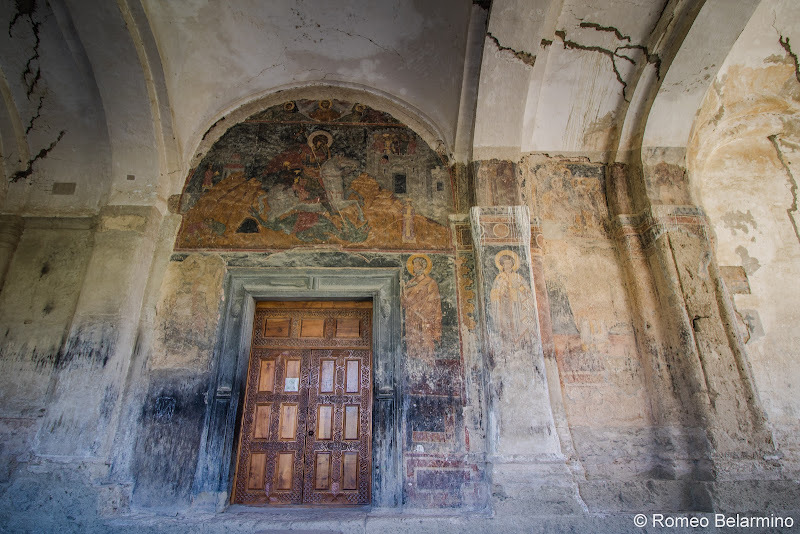 Many of Alaverdi’s frescoes were washed away when the dome collapsed, as it wasn’t restored right away. However, the Mother of God fresco in the altar managed to survive as it was protected in the greatly recessed altar. Alaverdi Cathedral is out in the countryside, surrounded by green grass, passed by a river, and back dropped by snowcapped mountains. The cathedral, monastery, and grounds are surrounded by a wall, built to prevent Persian invasions. Gremi was an important royal town along the Silk Road in the 15th century. Now only the church and citadel remain, as the rest was destroyed in 1616 when the Georgian’s rebelled against the Persians. Gremi’s famous resident was Queen Ketevan, who later became Saint Ketevan. Ketevan married Prince David, the heir to the Kakheti throne. David’s father was King Alexander. David’s brother, Constantine, converted to Islam and was raised in the court of a Persian shah. King Alexander stepped down to be a monk at Alaverdi and David became King. He died four months later in 1602 and Alexander was king again. Shah Abbas commanded Constantine to murder his father and brother and seize the throne, which he did. When Constantine wanted to take Ketevan as his wife, there was an uprising and Constantine was killed. Ketevan stepped up and ruled Kakheti while she waited for her request to the Persian shah to proclaim her son king. Her son, Teimuraz, became king, but he was ordered to send his sons and his mother to Persia, which he did, as a guarantee that he would be faithful to the Persians. War ensued between Persia and Georgia. After Queen Ketevan had spent years in prison, the shah decided to convert her to Islam and marry her. She refused and was martyred in a horrific way in 1624. 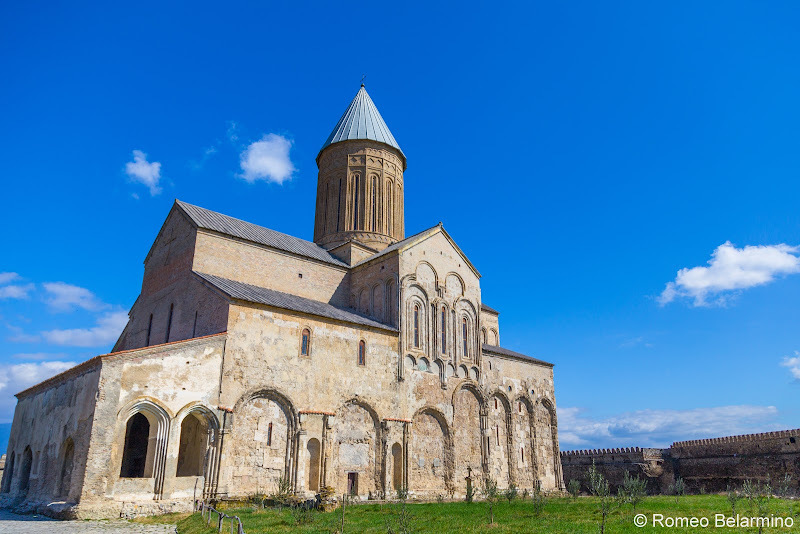 It is said that her holy relics illuminated and were taken away and buried in Alaverdi Cathedral. Gremi church, which was built in 1565, is dedicated to the archangels. Frescoes from 1577 cover the walls, including the last supper in the altar. The faces depicted in some of the frescoes are scratched off, which happened a few decades after the church was built. 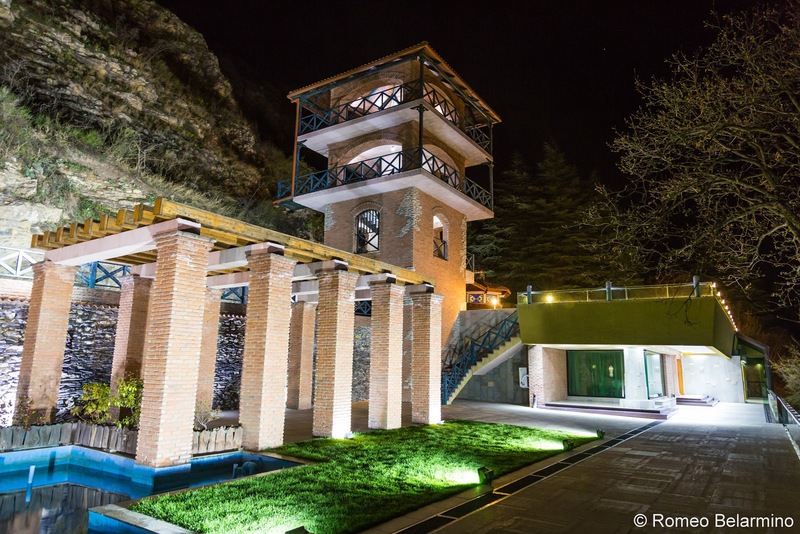 The bell tower houses a museum of artifacts, and the walls are covered in portraits of Kakheti kings, painted by a modern Georgian painter with a cartoonish style. 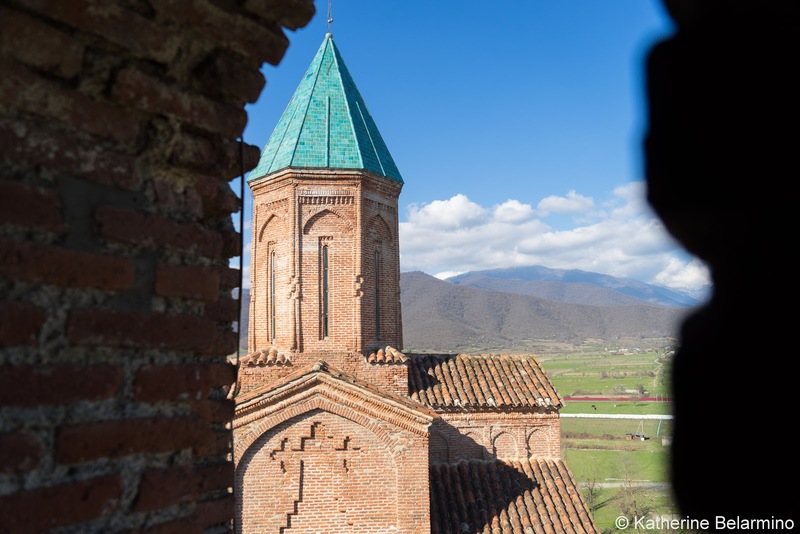 We only saw Nekresi Monastery from the road as we drove through Kakheti, but it has an interesting story. 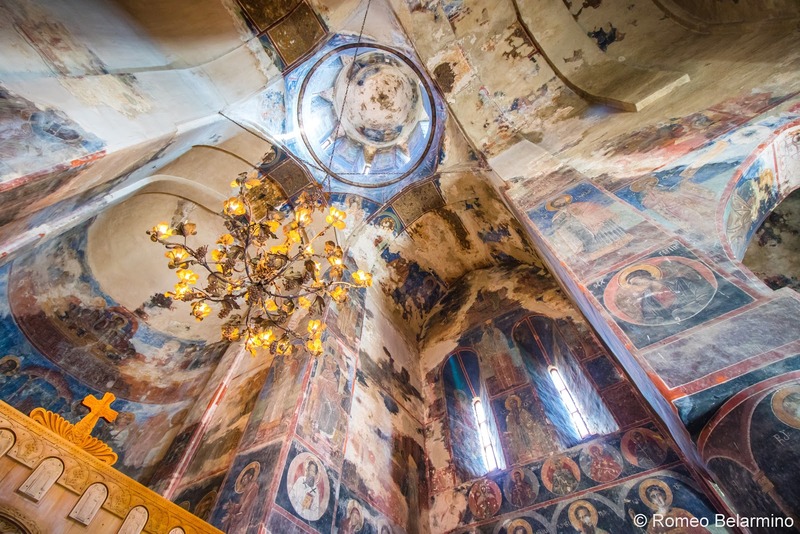 Nekresi Monastery is high up on a hill and overlooks the Alazani Valley. Pigs made Nekresi Monastery famous. A Muslim army was invading and the people had an ingenious idea of releasing pigs down the hillside. The idea worked and the Muslim army retreated at the sight of the pigs. Because of this event, Nekresi Monastery is the only Christian church in Georgia where pigs can be sacrificed. Sighnaghi is a unique town in Kakheti. St. Nino is buried in Bodbe Monastery just outside of Sighnaghi. 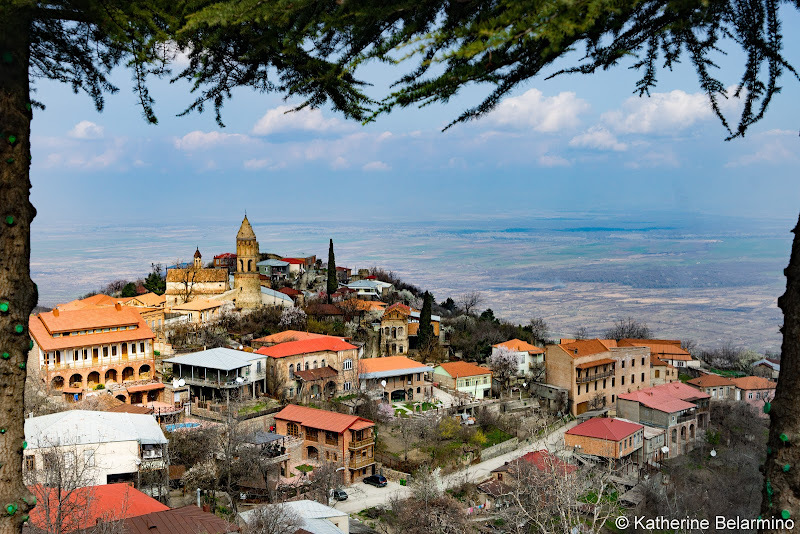 The city of Sighnaghi is high on a hill and surrounded by a four kilometer wall. This town also has one of the country of Georgia’s best restaurants, Pheasant’s Tears. The Kakheti region of Georgia is one of the important wine regions of Georgia and perhaps the oldest wine-producing region in the world. 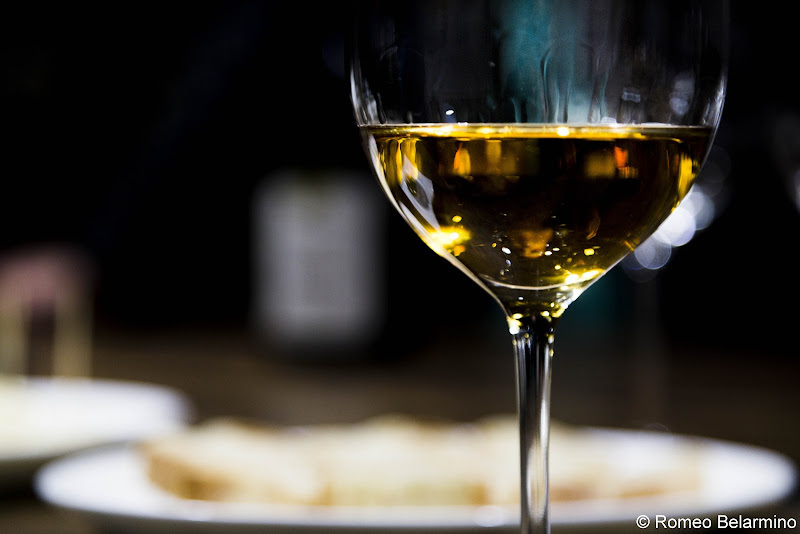 Not only has wine been made in the Kakheti region for thousands of years, the large clay vessels in which this wine is made, called Qvevri, have also been made in Kakheti for thousands of years through the present day. The Qvevri wine-making process of Georgia is so important, it has been named a UNESCO intangible heritage. Twins Wine Cellar in Naparevli not only offers wine tasting, but also has an extremely educational museum which explains the entire process. 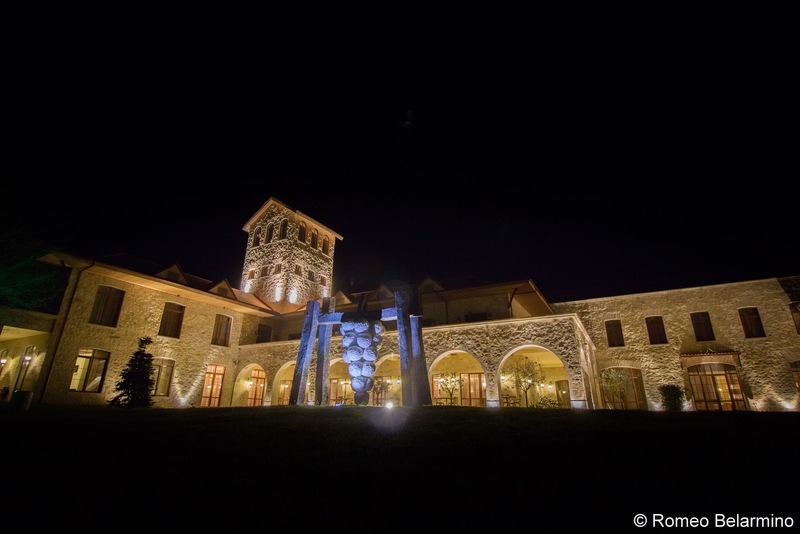 For our one night in Kakheti, we stayed in Kvareli at Kvareli Eden. While we weren’t at the hotel for long, I did make sure to squeeze in a visit to the wine spa after dinner. 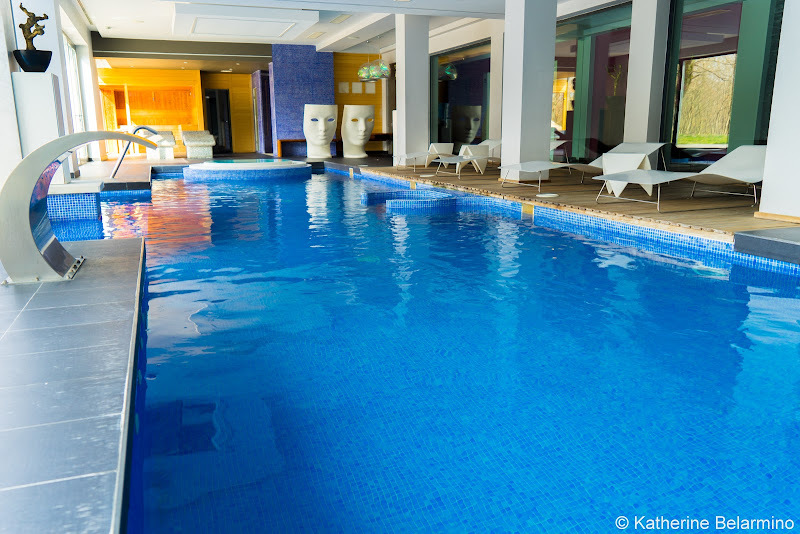 UNNICO SPA specializes in vinotherapie, where the residue of wine making is used for spa treatments. The pulp is supposed to be good for exfoliating and anti-aging. Other features of the hotel include a gym, indoor pool, lobby bar, and restaurant. While in Kakheti, we of course had to taste Georgian wine. 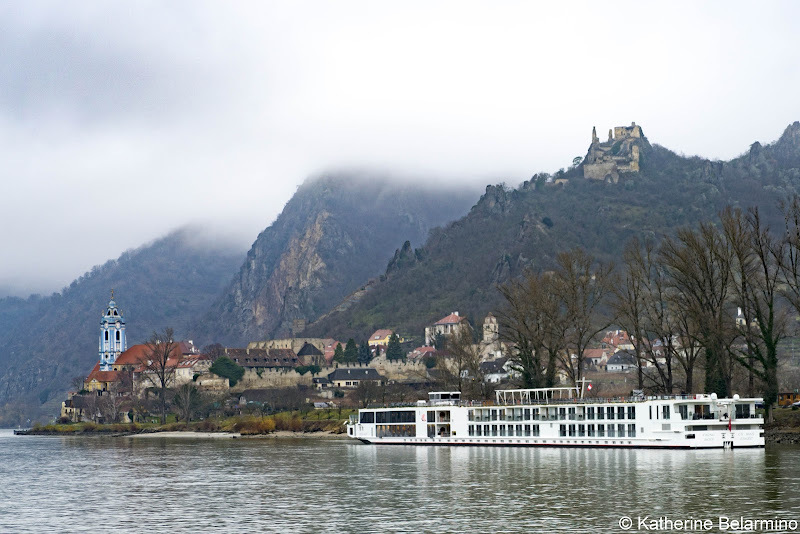 We visited a couple wineries, including Winery Khareba. The winery is located in the Gvirabi tourism complex, which at its base has tunnels used for aging wine. Fifty-eight meters above the tunnel is the Khareba restaurant. This large restaurant offers a menu of traditional Georgian foods paired with Winery Khareba wines. 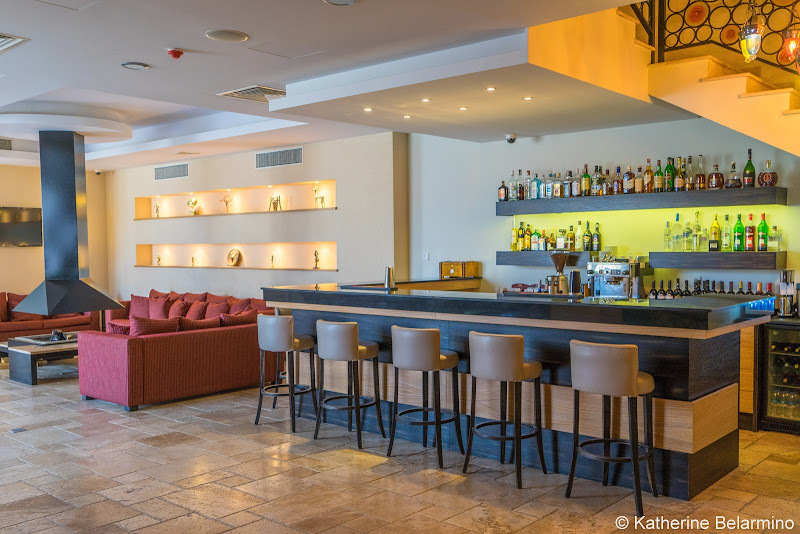 The restaurant’s elevated position provides views of the Alazani Valley and Kvareli vineyards. Leaving the restaurant, we were greeted with a dark night filled with sounds of a million frogs croaking and random sheep bleating. Thank you to the Georgian National Tourism Administration for hosting our trip to Georgia and making this post possible. As always, all opinions are my own. This article contains affiliate links. 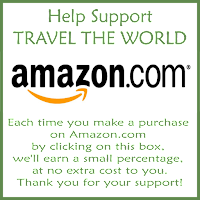 If you purchase through them, it costs you nothing extra and we earn a small commission which goes towards running this website and bringing you more travel stories.